Sports vision training, a subtype of optometric vision therapy, works on enhancing an athlete's vision abilities to take their game to the next level. Members of COVD create individualized training plans on a sport-specific basis to build visual skills, custom-tailored to each athlete and sport. "The public doesn’t realize that you need 17 visual skills to succeed in reading, learning, sports, and in life. Seeing ‘20/20’ is just one of those visual skills." [...] I think [vision therapy] was definitely the foundation of good, strong hand-eye coordination. 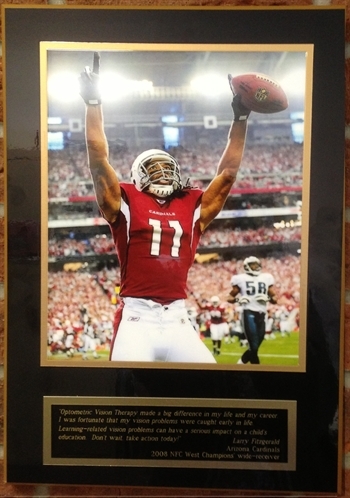 If you're having trouble taking your game to the next level, you might have a visual problem limiting your success...just like Larry Fitzgerald once did! 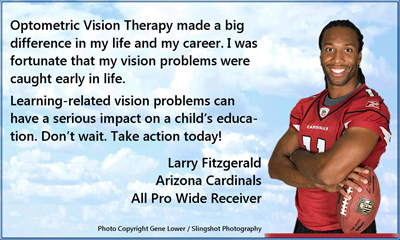 In a 2013 article featured in a supplement to USA TODAY, Larry shared the impact of vision therapy on his football career. 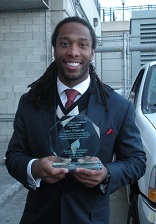 As part of our thanks to Mr. Fitzgerald, COVD awarded him the Making Vision Therapy Visible Award in 2009. A special plaque, including an autographed option, is available to commemorate Mr. Fitzgerald's support of vision therapy!